Yes, I am talking about the 2013 Newbery Award winner. I read it back then and gave it an A+ in my rating scale. For that alone I would have I revisited the story, but hearing it will be a Disney feature next year reminded me to read it again. And when I did, I came across new words I think you’ll appreciate. The ONE and ONLY IVAN is the fictional tale of a real-life Silverback Gorilla named Ivan who was captured as an infant in what is now the Democratic Republic of Congo in central Africa. 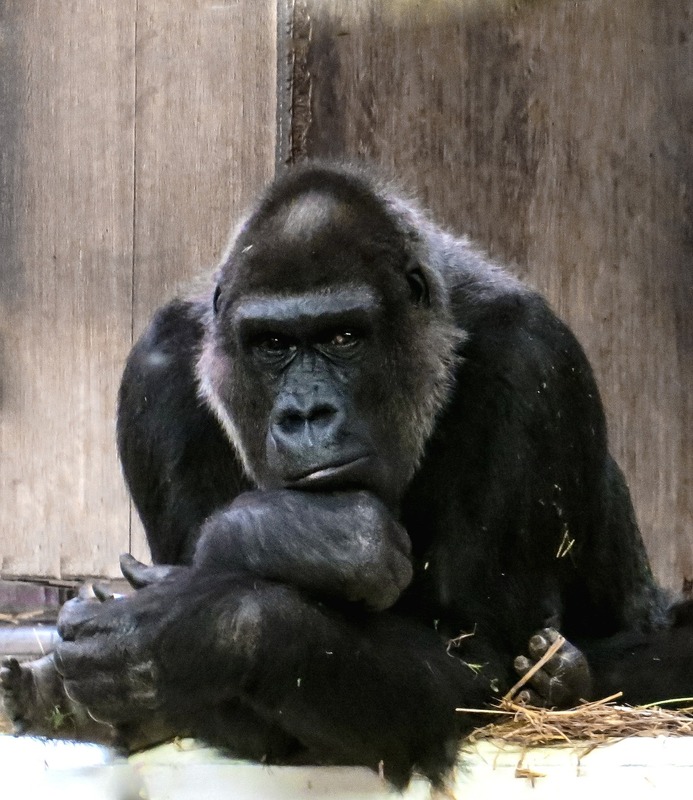 He spent 27-years alone in a cage in a circus-themed mall in Washington State until public outcry helped relocate him to the gorilla habitat at Zoo Atlanta. He died in 2012 at the age of 50. Katherine Applegate broke the unspoken rules of writing in 2012 and brought us, once again, talking animals. And I am so glad she did. Told in Ivan’s deeply emotional and honest point of view, THE ONE AND ONLY IVAN drags us through the gorilla’s existence in a down-and-out shopping mall, accepting of a simple and much too quiet life. Until one day Ruby, a baby-elephant too young to be taken from her mother, is brought into Ivan’s world and Ivan vows to make life change for the better. THE ONE AND ONLY IVAN offers a rich first person narrative. This story could not have been told in a human voice. It wouldn’t have carried the same emotional depth. In this quote, Ivan is thinking of his best friend, an elephant named Stella. These are words worthy of an award. Before Mack, before Bob, even before Ruby, I know that Stella is gone. I know it the way you know that summer is over and winter is on its way. I just know. Stella once teased me that elephants are superior because they feel more joy and more grief than apes. Right now I would give all the yogurt raisins in all the world for a heart made of ice. This story has a strong message of courage and friendship and hope. It is a classic worthy of the award. In my more recent review of the novel I came across Katherine Applegate’s Newbery Medal Acceptance speech delivered on June 30th, 2013. “…At its heart, of course, an animal fantasy is as much about humans as it is about animals– about the things we fear most and the thigs we most love, about pain and sadness, but also about redemption and hope. …Children know all about sadness. We can’t hide it from them. We can only teach them how to cope with its inevitability and to harness their imaginations in the search for joy and wonder. Nothing, nothing in the world, can do that better than a book.” K. Applegate. And those too are words worthy of an award. Keep writing my friends. The children of the world need our words.